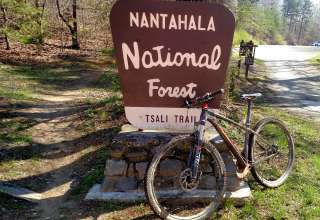 The best camping in North Carolina. The wide variety of landscapes and ecosystems in North Carolina offers some of the most diverse camping on the east coast. 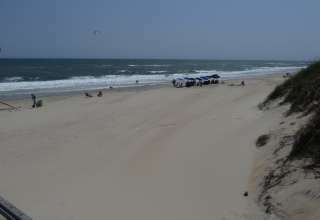 Tourists may flock to the popular Outer Banks, but the best North Carolina beach camping can be found along the southeast shores of Hammocks Beach and Carolina Beach State Parks, where dunes, wildlife, and watercolor sunrises are sure to delight. 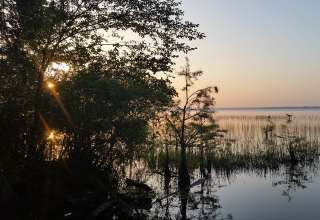 And it's not just the coastal dwellers who can enjoy peaceful beach camping: North Carolina is bursting with lakes, creeks and rivers, so you can fall asleep to the lull of the water and waves no matter where you go. Head west into the wooded Appalachian Mountains for epic state park camping set against the towering blue ridges. 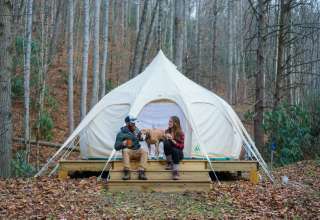 And for something off the beaten path, North Carolina offers a variety of private camping locations complete with scenic, open meadows and orchards, decked-out mountain cabins and everything in between. The Appalachian Trail winds right across the top of the Blue Ridge Mountains. Both Pepsi and Krispy Kreme Doughnuts were invented in North Carolina. Sometimes a little junk food while camping is allowed! In 1914, Babe Ruth hit his first home run as a pro in local Lafayetteville. The highest peak east of the Mississippi River is North Carolina's Mount Mitchell, towering over 6,000 feet above sea level. North Carolina's Kill Devil Hill was the site of the Wright brothers' first successful flight in 1903.